When you start shopping for a heat pump, there are a few things you need to look for. First, manufacturers rate the efficiency of most heat pumps in two ways: SEER and HSFP ratings. Higher SEER and HSFP ratings indicate a more efficient unit. SEER stands for Seasonal Energy Efficiency Rating, and is a ratio of how much energy (measured in BTUs) is pumped outside in cooling mode divided by the electricity used (in watts) for cooling. Look for a SEER rating between 14 and 18. HSFP stands for Heating Seasonal Performance Factor. It calculates the ratio of energy pumped indoors for heating to energy used for heating, but it’s a more complicated equation than the SEER rating because it also takes into account supplemental heating needs and the energy used to defrost the unit. Look for an HSFP rating between 8 and 10. Dual-mode compressors and motors that save energy by adjusting up or down according to the level of heating or cooling needed. Scroll compressors that are quieter, more efficient and last longer than traditional compressors. Though many of these features can only be found on more expensive heat pumps, they make up for the initial expense by helping heat pumps work more efficiently and save more energy throughout the pump’s life. 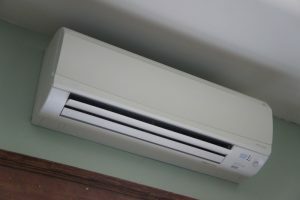 How a ductless system works and why it works better!